From the Cascade Range into the Columbia Valley to the desert esqe Yakima Valley, Red Mountain and Walla Walla; you can find a multitude of wineries and tasting rooms. What started as a small business and grown to a nationally recognized company, local artisan Suzi has created a stunning Map of every Winery in Washington State. With over 800 wineries and 14 Appellations, you can stare at this beautiful map for hours while you swirl, sniff and sip your favorite wine! 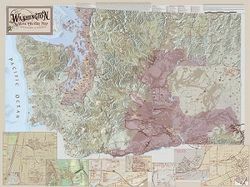 This one of a kind Washington State Vineyard map will also include Notes of Interest and 7 different inset maps.